The number of people being diagnosed with oral cancer has risen by almost a third, according to new figures. In data released by Cancer Research UK (CRUK), cases of the condition have risen by 30% since the mid-2000s. The data includes cases of cancers of the lips, tongue, tonsils and the middle part of the throat. CRUK has published the data in a bid to encourage more men and women to get familiar with their mouths, so they can detect any changes. There are currently around 13 cases of mouth cancer identified for every 100,000 people, rising from 10 per 100,000 a little over a decade ago, the charity has said. Preventable factors are the main cause in 90% of cases, the charity says, such as drinking, smoking, and the human papillomavirus (HPV), which can be vaccinated against. Dr Richard Roope, Cancer Research UK's lead GP, says "early diagnosis is absolutely key for the best results" and is urging GPs and dentists to look out for tell-tale signs of the disease. Online guidance has been published by the charity to help medics brush up on their knowledge. Dentist Nick Stolls, from the British Dental Association, added: "It is crucial that dentists and GPs know the signs to look out for and that patients bring anything suspicious to their attention as soon as possible. "This is why it's also important to visit your dentist for regular check-ups so that anything out of the ordinary can be picked up and referred quickly." 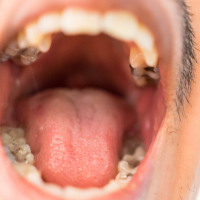 According to CRUK, men are more than twice as likely to develop mouth cancer than women. There are 5,300 diagnosed with the disease each year, compared with around 2,500 women. Dr Roope, added: "It's a real concern that so many men are getting oral cancer and that it's been on the rise in both men and women. "But the vast majority of oral cancer cases are preventable, so the good news is that people can cut their risk by quitting smoking and cutting down on alcohol. It's also vital that everyone knows what their mouth, tongue and gums usually feel like so they can spot anything out of the ordinary." People living with cancer should still be able to enjoy cover for holidays and overseas travel with our specialist cancer travel insurance.